Oh well, tis life. Believe it or not, I’ve never had a go to recipe for fired chicken? The first time I tried to make it was sometime in elementary school and the process consisted of seasoning the chicken with Laramie’s, dunking it in powder, and frying it until it felt like enough time had passed. The entire process use to drive me insane because I could never figure out how long to cook the chicken so that I didn’t have to slice it in half just to test if it was done. Then, afterwards, be a little bitter that I couldn’t get it crispy like at KFC. Even after working at KFC, I still couldn’t figure out how to make fried chicken at home. Keep the pieces separated while cooking. A little space between them helps the crust get crispy. Dirty oil will cause the chicken to brown faster and deeper so don’t worry if later pieces come out darker than the first few pieces, they aren’t burnt and it want greatly affect the taste. Peanut oil works best for frying. 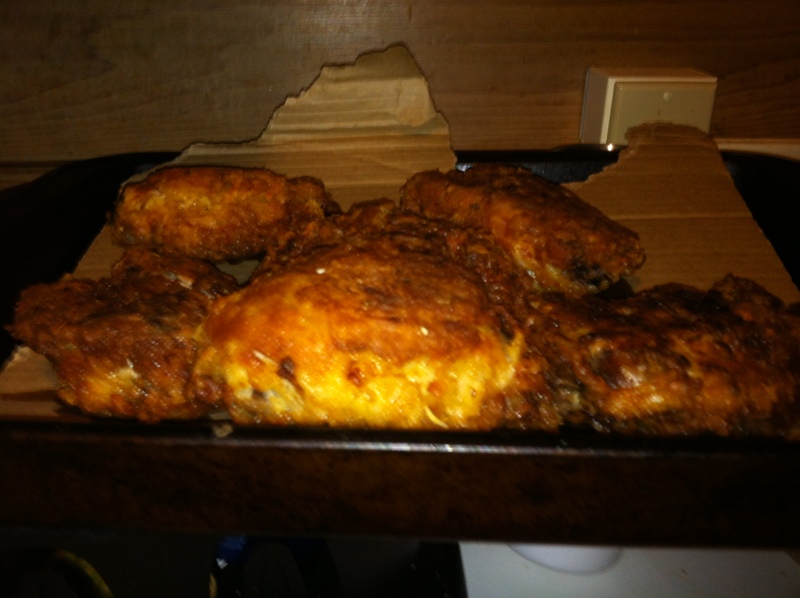 I used vegetable oil in the pictures but golden brown fried chicken is best achieved with peanut oil. The more you are able to fully submerge the chicken in the cooking oil the better. This is a three-step process that is very simple, but very long. PS, I’ve never tried this on tofu but theoretically, it should work out the same. ½ C Hot Sauce – I generally use Louisiana Red Hot, but since most of my readers are in Oregon, I imagine a lot of Srarchi will be used. You may not end up using all of the seasoning, which is okay. Also, just consider this advice, you don’t have to stick exclusively to these proportions. Before we begin, let’s talk about stove settings. When it comes to fried chicken, what you set your stove to will depend on how old the stove is. If you’re living in a newer apartment, medium should be fine. If you’re living in a historical building like my place, the burner could turn red before there is a problem. Either way, fill up your pot or pan with enough oil to reach no more than the middle line. The oil is ready for cooking when it reaches 350° or, for those who don’t have candy thermometers, when the oil sizzles when you toss in a pinch of flour. 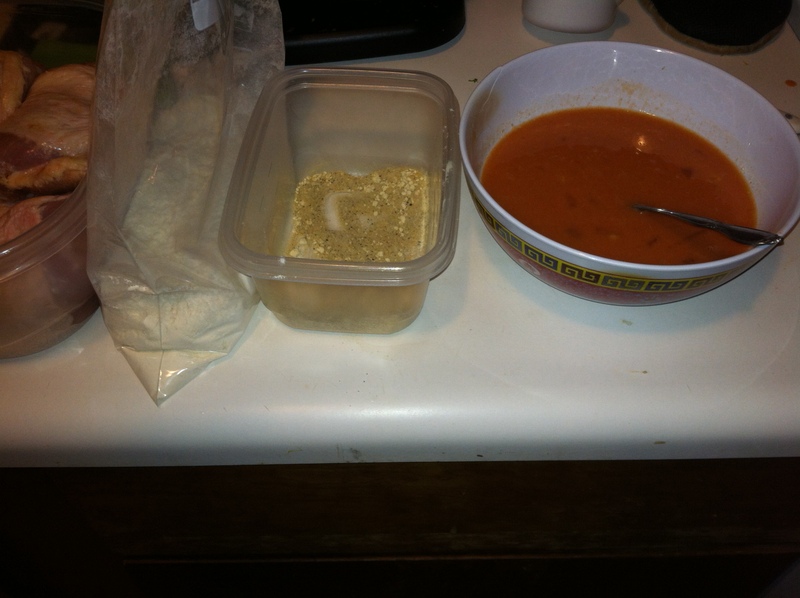 Make sure each individual piece of chicken is thawed and dry of any access liquid. Mix up each base and place them into a separate container. Place the flour into a plastic bag for the best results in shaking. Okay people, lets get ready to get our hands dirty. I mean literally. When it comes to the seasoning, you have three options: pat the chicken individually, sprinkle the seasoning over the chicken, or toss the chicken with the seasoning into the bag and shake. Make your decision based on how much control you want to have over the amount of flavor on your chicken. If you’re not sure, better safe than sorry and just cut into the pieces to make sure there are no red spots. Once the chicken is done, I would recommend placing it on sometime of paper product to drain the oil, make sure its think because there is going to be a lot of.